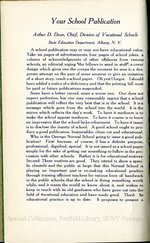 The Vocationist was published at Oswego Normal and Training School from 1912 until 1940. Published quarterly and produced in the Print Shop. "A practical magazine devoted to education, particularly mechanic arts, agriculture, and home-making."